920 is about building community and creating dialogue around psilocybin. We invite you to come together on the 20th of September to raise awareness and celebrate magic mushrooms. Join a 920 event nearby or host one with your friends. We imagine a world where responsible adults are free to live healthier, happier and more fulfilled lives with the help of psilocybin mushrooms. We as an organization see ourselves supporting the mycelial network of individuals and groups that are carrying on the current momentum of the psychedelic renaissance movement. 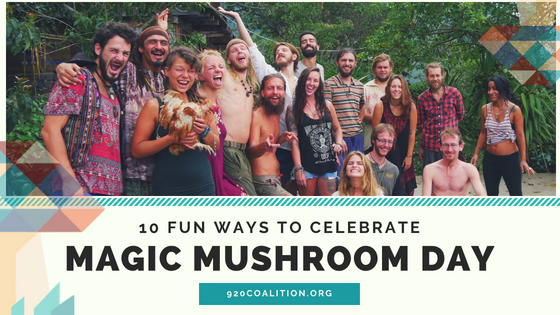 We do this by creating tradition of a global annual holiday for magic mushrooms on the 20th of September. Our mission is to bring together as many people as possible to encourage dialogue, raise awareness and create community around the intelligent and beneficial use of psychedelic psilocybin mushrooms. How to Celebrate Magic Mushroom Day? There are many ways you can hold a local 920 event. We put together a list of ideas that range anywhere between small private events up to big 920 festivities.